From my first interaction with ICD Business School, in which I requested information regarding the programmes they offered, they left a great impression; the staff explained everything so clearly that I did not need to ask further questions. I got the feeling that they really cared about my needs. It was then when I understood what a boutique college was, and ICD is the only boutique college in Ireland. For me, it is very important to feel welcome and comfortable enough to clarify any doubts I might have. As a result, I decided to study a BA in Business Studies with a marketing pathway. Another fact that made ICD appealing for me was that it has QQI validation; Quality and Qualifications Ireland validates the quality of further and higher education and training in Ireland. ICD is also accredited in ACCA (Association of Chartered Certified Accountants) which says a lot as it reflects the quality of the college, which is really important. Its location was relevant to my decision too because it is right in the heart of the city centre, which is very handy for me. There are several bus stops just outside the college and a Dublin bike station within two minutes walking distance which is great for students coming from other parts of the city. Choosing ICD Business School to study has been a great decision. The lecturers are professionals who are working in the fields they are teaching which makes their knowledge more practical — They can share real-life working experiences regarding the theory or topics that we discuss in classes. Additionally, the small class size makes a big difference in the way staff and lecturers interact with you and the classes are more interactive. The cultural variety in ICD has also enriched my experience as a foreign student. I have made friends from different countries and have learned about their culture too. Study is serious business in ICD, but the college organises activities outside of college as well, such as sightseeing tours, barbecues, trips to the countryside and so on, to encourage the student’s participation and integration. This is always great fun. 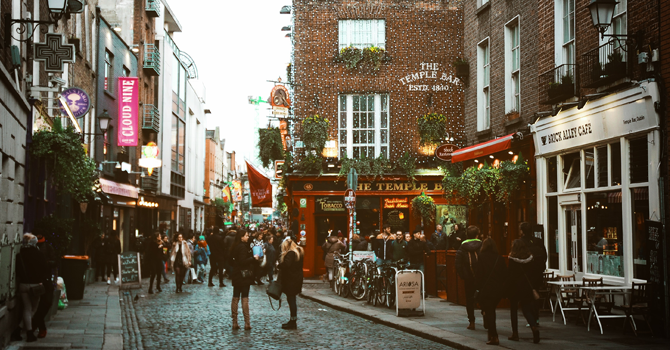 Studying abroad and selecting a quality college were decisions that have changed my life and I have to say that I am very happy with my experience of studying in Ireland. It has made me realise that I am able to do and achieve things that I never thought I could. Living and studying abroad has made me realise what I am made of.